Over at Resorts Atlantic City, movie and TV star Dan Aykroyd hosted a VIP event to promote his Crystal Skull vodka. While there, he stopped in to see rock star photographer Mark Weiss, who is appearing and showing his art at the Boogie Nights Rock & Pop Art Gallery. 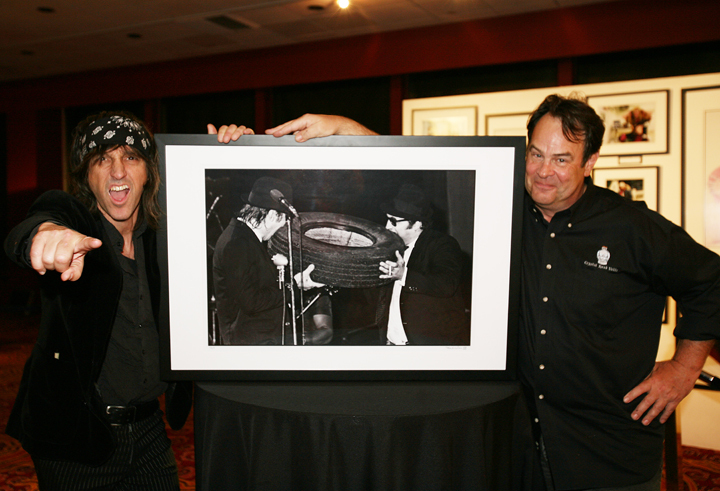 Weiss showed a photo he took of The Blues Brothers in July 1980, and Aykroyd immediately recognized it and knew that it was taken at the Palladium in New York City. "The stage set was an old gas station," Weiss remembered. "They came out holding the tire and then, with perfect timing, they took a big bite and they went into the song 'Rubber Biscuit.'"